Summer Reads VISTAs work together to fight the summer slide – the decline of literacy skills in low-income children in grades K-3 over the summer. 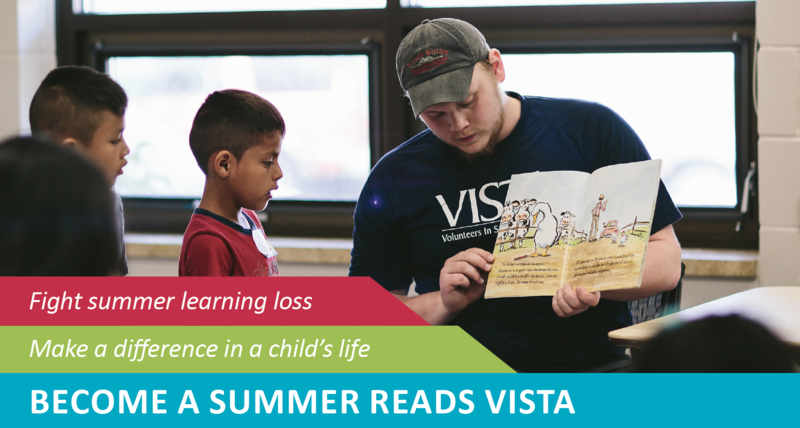 At summer schools and community sites, VISTAs provide reading tutoring to children who are performing below grade-level and are most in need of support. VISTAs also lead small groups in creative and educational enrichment activities. APPLY at mnliteracy.org/summerreadsVISTA by April 30, 2019. Questions? Contact Courtney Zaato at czaato@mnliteracy.org or 651-251-9151. 50+ positions are available in the Twin Cities and Greater Minnesota. Applications accepted on a rolling basis between February and April.